Mookie Betts and the rolling Boston Red Sox try to win their 11th consecutive game when they host Toronto again at Fenway Park. 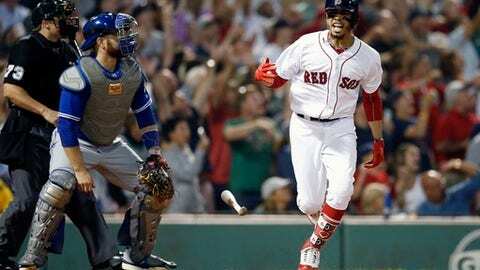 Betts, who leads the majors with a .352 batting average, had a grand slam and five RBIs in Thursday night’s 6-4 victory. Boston owns the longest current winning streak in the big leagues and hasn’t lost since getting routed July 1 at Yankee Stadium. At 66-29, the major league-leading Red Sox are 37 games over .500 for the first time since 1949. Rick Porcello (11-3, 3.58 ERA) starts for Boston against rookie left-hander Ryan Borucki (0-1, 2.25). Mets right-hander Noah Syndergaard (4-1, 3.06 ERA) comes off the disabled list to make his first big league start since May 25. The 2016 All-Star has been sidelined by a strained ligament in his right index finger. On the mound for the Nationals is Tanner Roark (3-11, 4.76), who is tied for the major league lead in losses. He got no-decisions in two previous starts vs. the Mets this season. Matt Harvey wanted nothing more than to prove he could still pitch at a high level when he was traded from the New York Mets to Cincinnati in May. Since the deal, the right-hander has lowered his ERA from 7.00 to 4.48 – and allowed two or fewer earned runs in each of his last four starts. Harvey will try to continue his recent surge when he pitches for the Reds as they open a weekend series against the St. Louis Cardinals, who send right-hander Carlos Martinez (6-4, 3.05) to the mound. The Oakland Athletics own the best record in the majors over their last 24 games, going 19-5 during that stretch and climbing to 12 games over .500 (53-41). Oakland finished off a series against defending World Series champion Houston on Thursday with a victory, giving the A’s three wins out of four games, and they’ll open an interleague series at San Francisco. Edwin Jackson (1-0, 2.45 ERA) starts against Giants ace Madison Bumgarner (2-3, 3.09). Prized rookie Walker Buehler returns to the Los Angeles Dodgers‘ rotation at home against the Angels. Buehler (4-2) made his last big league start on June 8 and has made only one awful relief appearance since then because of a rib injury. He allowed five runs in that outing against the Chicago Cubs two weeks ago, raising his ERA from 2.63 to 3.44, but he’s now healthy and has Dodgers manager Dave Roberts considering a six-man rotation to begin the second half.